The Compuware U16 program wrapped up November by winning the Gloria Rints International Silver Stick Tournament in Whitby, setting the stage for a busy December across the Minor Midget and Midget AAA circuits. A number of recent events including the GTHL Minor Midget Top Prospects Game, the Waterloo Gold Puck Tournament, the OMHA ETA & SCTA Minor Midget Showcases and the ALLIANCE Midget All-Star Weekend showcased top talent eligible for both the 2018 OHL Priority Selection as well as the 2018 OHL Under-18 Priority Selection. Later this month, top Minor Midget players from across North America will converge on Toronto for the annual Marlboros Holiday Classic that features 60 teams from throughout Ontario and the United States. The tournament will run from December 27-30 at Canlan Ice Sports Arena Etobicoke, York as well as Westwood Arena. Here’s a look at some of the top recent Minor Midget and Midget AAA performances from across the region. Owen Kosova (Toronto Marlboros) scored twice to lead Team GTHL Red to a 6-2 victory over Team GTHL Blue in the 18th annual GTHL Midget AAA All-Star Game. 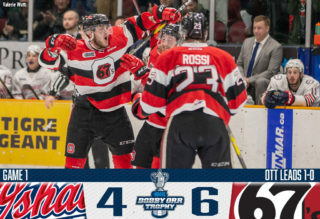 Peter Stojcevski (Toronto Nationals) and Owen Sound Attack prospect Ryan O’Toole (Mississauga Rebels) would score to give Team Red a 4-0 lead before Team Blue got on the board when Hamilton Bulldogs prospect Ryan Tverberg (Toronto Jr. Canadiens) fed Duncan Scullion (North York Rangers). 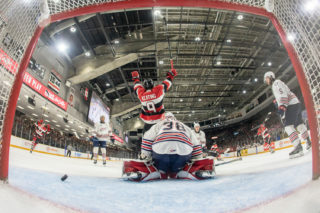 Steve Katsis (Toronto Red Wings) would bring Team Blue within two before Mississauga Steelheads prospect Josh Belgrave (Toronto Titans) hit the empty net for Team Red. Kosovo earned Player of the Game honours for Team Red while Tverberg was named Team Blue’s Player of the Game. Ryan Del Monte (Toronto Nationals) scored the overtime winner as Team Graves-Primeau-Tucker defeated Team Clark-Weaver-Corson by a score of 4-3. The 10th annual GTHL Top Prospects Game held at the Scotiabank Pond featured a big crowd on hand with scouts from across the Ontario Hockey League in attendance. Team Graves-Primeau-Tucker had a pair of goals from Del Monte while Toronto Marlboros teammates Danny Zhilkin and Ethan Del Mastro also found the back of the net. The Don Mills Flyers trio of Shane Wright, Brennan Othmann and Brandt Clarke accounted for Team Clark-Weaver-Corson goals. 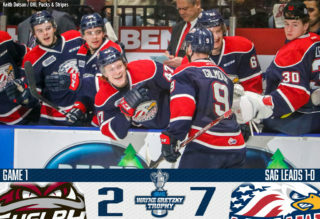 Del Monte and Wright received Player of the Game honours for their respective clubs. The GTHL will hold its annual Midget AAA Top Prospects Game on Tuesday December 18th. The Sudbury Minor Midget Wolves were crowned champions of the 48th Waterloo Gold Puck Tournament, defeating the Kitchener Jr. Rangers by a score of 3-1 in the championship final. Sudbury played to a perfect 6-0 record, defeating the Silver Stick Champion Compuware U16 program by a score of 4-0 in semi-final action before claiming victory over Kitchener. In Midget AAA action, the North Bay Trappers defeated the Oakville Rangers by a score of 7-1 to be crowned champions. North Bay also went 6-0, defeating the Clarington Toros 3-2 in semi-final action to reach the championship game. The SCTA Minor Midget Showcase took place at the Sixteen Mile Sports Complex in Oakville, Ont. this past weekend. 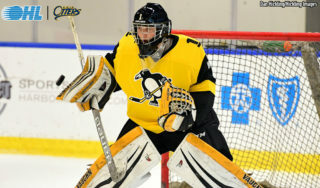 The weekend featured 10 games as the Niagara North Stars and Halton Hurricanes came away with 2-0 records. Top performers on the weekend included Niagara North’s Matteo Giampa (13-20—33) and Halton’s Lawson Sherk (10-22—32). In the OMHA Midget AAA All-Star Game, the SCTA prevailed over the ETA by a score of 7-5. Jonah Boria (Niagara North Stars) earned Player of the Game honours for the victors while Steve Whittle (York-Simcoe Express) earned the distinction for the ETA. The 10th annual ETA Showcase took place in Aurora, Ont. on December 1st and 2nd. Eighteen games took place, with the Ajax-Pickering Raiders, North Central Predators, Quinte Red Devils and Whitby Wildcats coming away with undefeated records. Some of the league’s top scorers in Whitby’s Brenden Sirizzotti (22-37—59), Peterborough’s Jon-Randall Avon (22-19—41), York-Simcoe’s Ryan Cutler (9-22—31) and North Central’s Ethan Larmand (18-12—30) earned Player of the Game honours for their respective clubs throughout the course of the weekend. In the weekend’s Midget AAA All-Star Game, the West All-Stars defeated the East All-Stars by a score of 4-1. 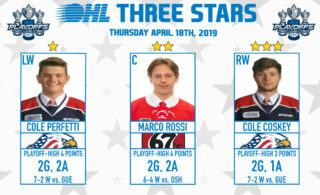 Adam Miwa (Richmond Hill Coyotes) earned Player of the Game honours for the West while Kitchener Rangers prospect Matt McCullough (Clarington Toros) earned the distinction for the East. Brett Harrison (London Jr. Knights) scored the overtime winner 2:58 into the extra frame as Team Navy defeated Team White 7-6 at Southwood Arena in Woodstock, Ont. Tied at five entering the third period, Riley Wood (London Jr. Knights) and Deni Goure (Chatham-Kent Cyclones) exchanged goals, setting up the overtime finish where Harrison stepped up to give Team Navy the win. Goure (1G, 1A) earned Player of the Game honours for Team White while Marko Sikic (2G, Kitchener Jr. Rangers) earned the distinction for Team Navy. In Midget AAA action, Team Navy defeated Team White by a score of 5-3 behind a pair of goals from Cameron Krupa (Elgin-Middlesex Chiefs). 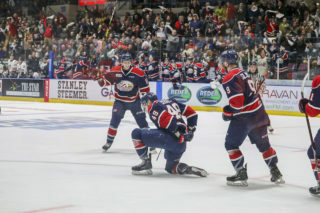 Lucas Mann (Lambton Jr. Sting), Mississauga Steelheads prospect Michael McKnight (Elgin-Middlesex Chiefs) and Isaac Legood (Windsor Jr. Spitfires) also scored for Team Navy while Brett Allen (Waterloo Wolves) earned Player of the Game honours for Team White.